…and topping out, while Charlie Panton watches. 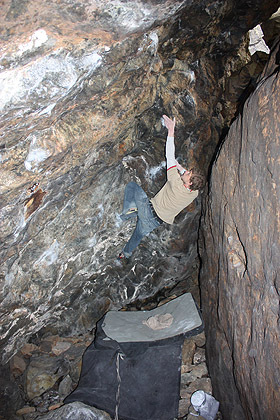 Dave Noden and Chris Davies have produced a pair of impressive problems in the ‘A – frame’ cave (aka: the Hall of the Mountain King) immediately above the Barrel in the Llanberis Pass. 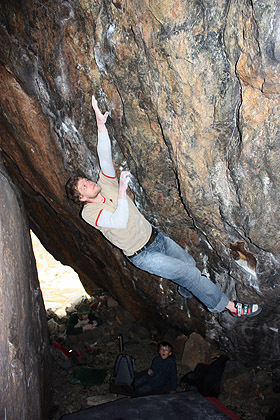 Back in February Dave climbed Original Problem V6/7A – the obvious stand up line at the right side of the cave exiting through the upper crevasse to a proper top out on the boulder summit. 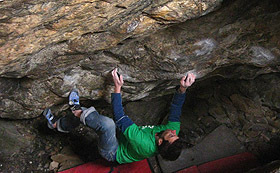 “Pull on with good sidepulls and a choice of slopers etc. from a stand start in the far right hand side of the cave. A couple of pulls and a sneaky foot lock lead to daylight via the jug and an amazing thumb pinch back hand.” Explained Dave. Dave hung a pad down the crevasse from a set of long slings secured to a boulder thread at the top. This provides some back protection, however it would still be possible to rattle back down into the cave. Next up Chris Davies nailed the right hand prow line. Stoned Temple Pilots V12/8A+ starts sitting on a terrace of rocks: left hand on good square jug, right on an undercut pinch thing. 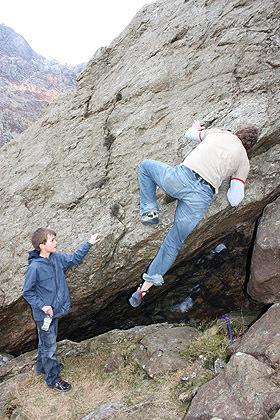 Move up and rightwards onto two crimps on the face of the rib and make a desperate jump into a backhand (i.e. 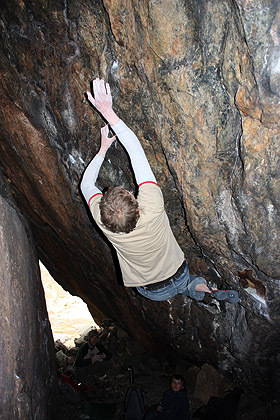 the starting hold of the Original Problem). 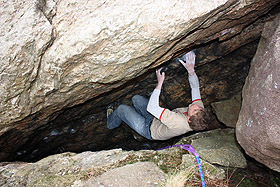 Continue up into undercut pinch and slopey shelf before the jug is reached and an obligatory finish exiting the cave as per the Original Problem. 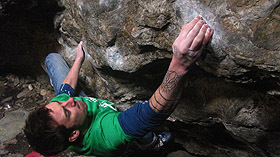 Dave’s beta is as follows: “Pull on from the left hand patio: crimp in right, pinch in left. 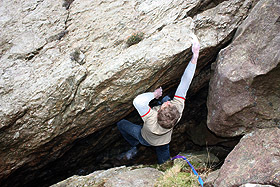 Make an initial throw to a crimpy rib with left hand then over with right to a finger jug; move up and right on crimps and sidepulls until you can get the slopey shelf and jug about half way up Original Problem, which is followed to its top out. To read a full account of how the cave was developed go to Nodder's blog.